In hopes of feeling fall-ish, I turned to my trusty craft supplies. I remember doing this craft when I was little and making “stained glass”. Martha makes Valentines Hearts this way too. But today friends we are making Bats, or according to my 2 yr old son- “Batmans”. This is a great craft to do with the kids, actually- if my “active, just turned two, independent boy” can do it, then your dog can probably help you. Break your crayons and remove the wrappers. This is the best job for kids, who doesn’t love to break stuff? 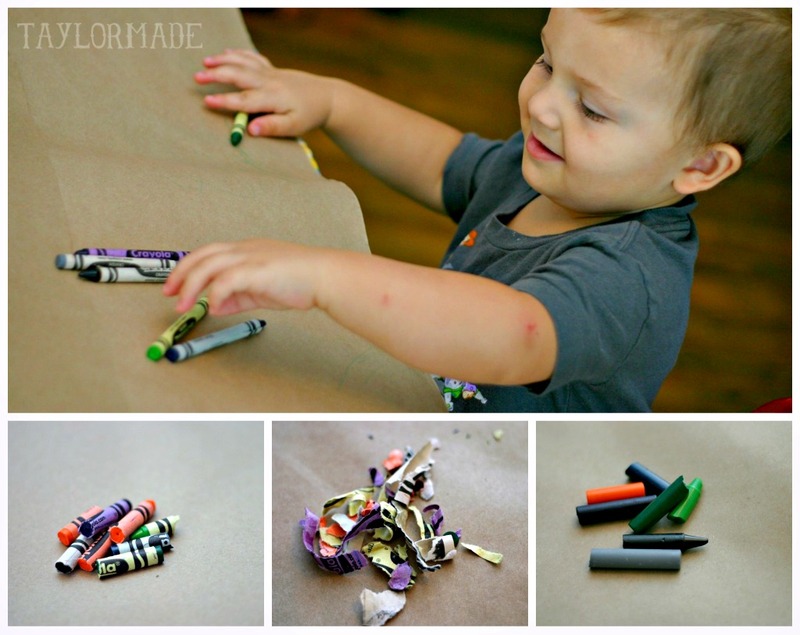 Use the scissors and make shavings from the crayons. Place the shavings on a piece of wax paper. Let the kids arrange the shavings and pick the colors. Then cover it with another piece of wax paper. Make sure to use 2-3 paper towels under the wax paper and over it. 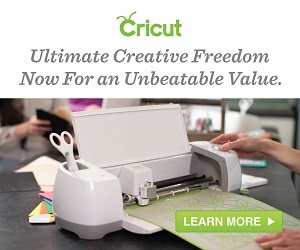 The shavings kind of seeped through and I wouldn’t want your iron to look like mine. Melt the crayons for a few seconds. Use the Taylor Made Bat Template found HERE and cut out a few bats from the paper. You can hang them as is or make them fly. 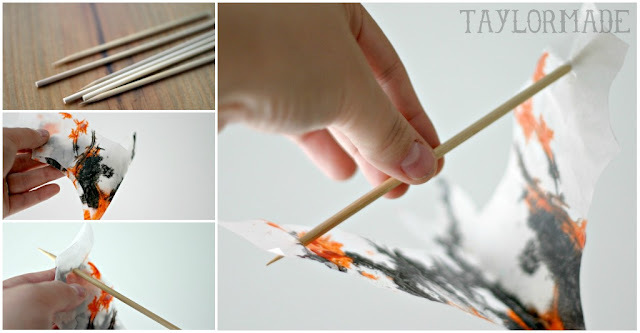 Use Bamboo skewers, fold the bat in half down the middle, then push the skewer through the ends of the wings. Use thread or fishing line to hang them. Fun idea…I love it. Thank you for sharing. I’ll definitely be trying this out with my nieces/nephews. Thanks for the idea! What a fantastic idea! At first I thought you peel the melted wax from the paper, then cut out the shape.. but now I see you leave it all together. I love it! If you have other kid friendly crafts, I’d love it if you would submit them :) If you would like to display a featured button on your site, you can grab one from the right side bar of your post above.